Seadrift Visitor Centre stands near the northern end of the broad sandy beach which extends for nearly two miles along the south eastern end of Dunnet Bay. Visitors should look out for a caravan site half a mile south of the village of Dunnet. At the north end of this is a large car park providing beach access, and Seadrift can be found on the upper floor of the building whose ground floor provides facilities for the caravan site. Seadrift is accessed via a set of steps on the end of the building, which carry the painted tracks of birds and animals. The visitor centre itself is larger than you expect from the outside, and comprises a main room housing most of the displays and the viewing area, and a smaller room aimed at younger visitors or educational groups. Dominating the main room is the run of windows along its seaward side. As the centre is on the first floor these give a great view over Dunnet Bay and its beach, and, to the right hand side, the landward end of the headland that leads to Dunnet Head. Several pairs of binoculars and a telescope are provided to allow you to spot the birdlife which abounds in Dunnet Bay, together with a reference book about birds to help you identify what you have seen. Tiered seating is provided to allow groups to make the most of the view, and the whole thing is very well done indeed: a thought that occurs time and again as you wander around the visitor centre. At one end of the windows you find a display called "Life on the Ledge". A series of inserts carry preserved birds while the brief and accessible blurb talks of the thousands of seabirds which each spring rear their chicks on the cliffs around Holborn, Dunnet and Duncansby Heads. Erosion of the layered rocks by water has resulted in the creation of vertical streets in the rocks, inhabited by different birds, with some couples returning to the same spot year after year. The issue of sustainability raises its head as the text goes on to note that climate change may be threatening local food supplies and asks whether these cliffs may one day fall silent. Another simple but highly effective display focuses on the Pentland Firth, one of the world's wildest stretches of water. Background information on whales and dolphins, beached whales, fishing, and seaweed forests is illustrated by a fascinating series of skulls, dominated by a pair from a pilot whale and a killer whale. 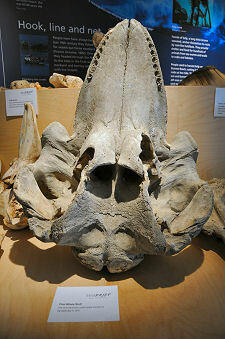 These certainly help bring home the sheer size of some of the creatures found around these coasts. The far wall of the main room carries a series of exhibits looking at the coastal zone, and in particular the dunes at Dunnet Bay, one of the largest sand dune belts in northern Scotland. 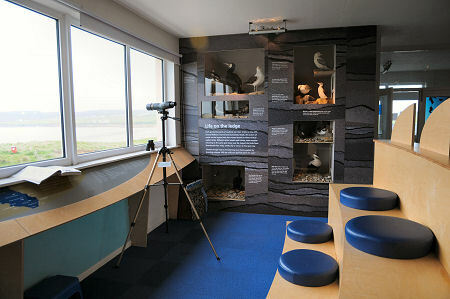 Displays range from a large collection of shells to preserved otters and birds, including a sparrowhawk. The information includes pieces on the formation and dynamics of sand dunes, the history of the dunes at Dunnet, and background on some of the flowers that can be found here, including nine species of orchid and the tiny purple flowered Scottish primrose, which only grows near the coasts of northern Scotland. 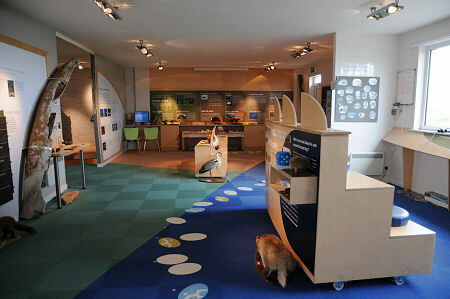 The room aimed at younger visitors includes a series of activities. Here you can see how you compare in size and weight with a range of wild animals, examine objects through magnifying glasses or complete two and three dimensional jigsaws. In the main area of the centre, younger visitors will also appreciate the draws which can be opened to reveal treasures from the deep, while everyone who spots it will be fascinated by the jar containing a pair of adders. Seadrift also acts as the base for Highland Council's Countryside Rangers, who organise outdoor walks, public events and activities for schools. While visiting Seadrift, make sure you take the time to enjoy the magnificent beach it overlooks. A wooden viewing platform above the steps down to the beach is home to rope texts of the tongue twister "she sells sea shells" and is typical of the nice touches you find everywhere at Seadrift.